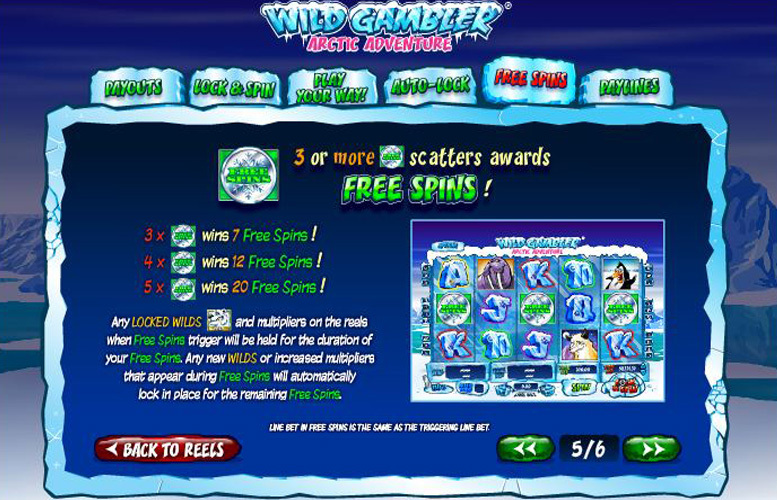 The sequel to the hugely popular Wild Gambler, Wild Gambler 2: Arctic Adventure this time takes players to the icy cold tundra for another opportunity to win big out in nature. Many of the features from the original title are back this time, some with slight upgrades and different dynamics. Great bonus features. The “lock and spin” mode from the original title has been updated slightly for the sequel. The title looks and feels perfect. It uses solid illustrations, upbeat music, and a strong theme to provide a quality gaming experience. Despite the upper betting limit being increased by 100% from the initial title, it remains low. Most players would find £200 per spin but there are certainly those who like to bet much more than this when playing slot machines. The “lock and spin” mode might be difficult to grasp for some players. It’s quite different from most game’s bonus features and as such could put off some players who are just interested in a quick spin to try and bag some cash. White tiger = 1,000x the line bet. Walrus = 800x the line bet. Elk = 500x the line bet. Wolf = 400x the line bet. Penguin = 300x the line bet. During the main game, when “wilds” appear on the reels, players are given the opportunity to lock them in place before taking another spin. To freeze the “wilds”, simply click the “lock & spin” button. Players should note that the stake will vary depending on how many wilds are in view, and based on their specific position on the reels. The amended bet per spin is calculated then displayed above the “lock & spin” button next to “spin”. In addition, players can select which “wild” symbols they wish to lock down. After a spin successfully drops “wilds” onto the reels, clicking the symbol will select or de-select it. On hovering over the “Lock and Spin” button, a padlock icon is displayed on the locked “wilds” and the minimum win for that configuration is displayed. Finally, if players wish to increase or reduce their stake during the “lock and spin” mode, they can use the custom stake arrows to raise or lower the number of locked “wilds”. This gives them ultimate control over how much they bet per spin. If players have a set “wild” pattern that they want to keep in place, then they can choose to disable the “auto-locking wilds” by ticking the box the first time “lock and spin” is pressed. This means the current layout of “wilds” will stay in position for every spin. Before spinning, players can select their “wild” positions and then tick the box to have their unique pattern of “wilds” still locked in place. They can enable, or disable this feature in the “options” tab. If “auto-lock” is disabled, the padlocks will be red. If “auto-lock” is enabled, the padlocks will be black. Landing three or more “scatter” symbols anywhere on the reels awards a set number of free spins. Three, four, and five symbols will award seven, 12, and 20 spins respectively. Also, any locked “wilds” and multipliers on the reels when free spins are triggered will be held for the duration of the free games. Any new wilds or increased multipliers that appear during free spins will automatically lock in place for the remaining free spins. King = 100x the line bet. Queen = 80x the line bet. Jack = 70x the line bet. Ten = 60x the line bet. 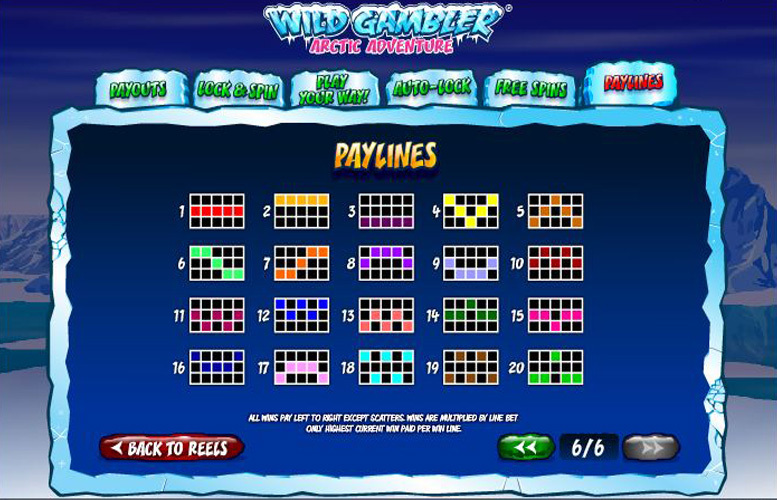 Players are only able to adjust the number of win lines played per spin on Wild Gambler 2: Arctic Adventure. This is because the number of win lines is fixed at 20. The maximum bet possible is £10, and the minimum is just 1p. This makes the smallest cost of a spin just 20p and the largest £200. Whilst this will be more than enough for most players, the highest rollers out there will likely find it limiting – especially when its considered that there are some slots that allow for 10x this upper betting limit. All told, the Wild Gambler 2: Arctic Adventure slot machine is a great game with fantastic artwork, a strong theme, and marvellous bonus features. Unfortunately, it’s not perfect, however. 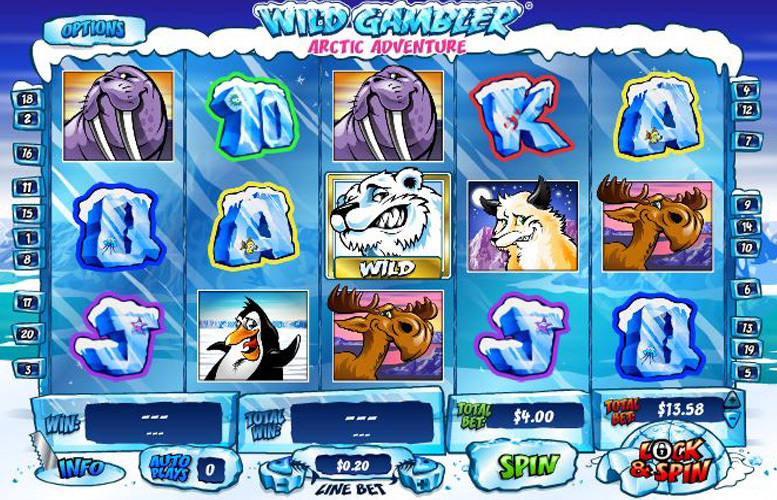 The low upper betting limit, the small main game prizes, and the somewhat difficult-to-grasp main bonus game could limit the fun a player is able to glean from playing Wild Gambler 2: Arctic Adventure. This game has a rating of 5 / 5 with 465 total reviews by the users.